Detox: Day 8 and Feeling Great! Day eight of the detox. I’m starting to notice more of a difference especially in my energy level and mood. I initially did the detox because I was feeling sluggish and a bit depressed. I thought that by not only feeding my body properly but also focusing more attention on myself, I would start to feel better – and it’s working. I have a few challenges up ahead, notably, this weekend is my mom’s birthday and I’m not sure how well the conversation will go with my “meat and potatoes” Irish descendant parents about why I am not partaking in birthday cake. I can hear their pleading yet mocking voices now, “One little piece won’t kill you…..” Sure, it won’t kill me, but it will kill all of my hard work so far. By then, I would be on day 13 – so that’s nearly 2 solid weeks of sacrifice and thoughtful planning down the tubes. Once you eat anything on the “no no” list, it’s over. I wish we had a dog. Or more kids in my family (I’m an only child) so no sneaking the cake to a sibling or pet. I could always do like in that one Seinfeld episode when Jerry doesn’t want to eat the mutton so he spits it out in Grandma Memma’s napkins. Please tell me you know what I’m talking about! If not, here’s a clip (sorry for the poor quality). Anyways, the fact that I’m already feeling so much better has been totally worth it and after another week or so, I’ll feel even more better. So that’s exciting! I’ve also started my running challenge and I even pushed myself to get up a bit earlier this morning to get my run in. For those that know me, they know that I am NOT a morning person. Snooze and I have been intimate lovers for many, many years – possibly my longest relationship. BUT, despite my everlasting love for Snooze, I just forced myself to get up and get out the door as quickly as possible. On the bright side, by the time my workout was over, I was just starting to wake up and I had lots of energy for most of the day. The exhaustion didn’t hit me like a brick wall until a couple of hours after lunch. But even though my body was tired, my mind was alert and the afternoon passed quicker than it usually did sans exercise. It’s enough to motivate me to do it all over again tomorrow. I know, I’m definitely on fire this week! So, I’m on a massive stir fry kick these days mostly because by the time I get home after a long day (especially one like today) and Mondays are killer for me too. 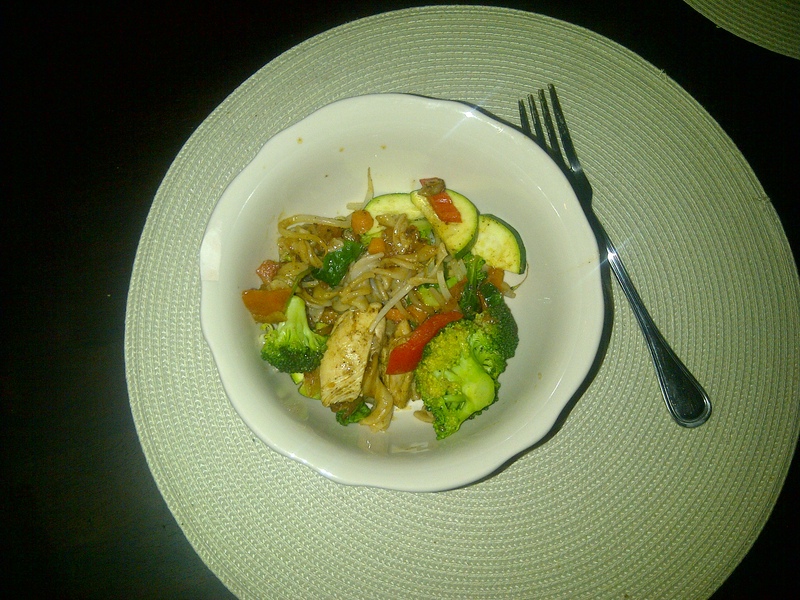 Stir fries are quick and relatively easy to prepare. Plus, you get to be as creative as you like with ingredients. Heat the oil in a large frying pan and add the spices. In the mean time, cook the pasta. Chop the onion and garlic and add it to the frying pan. Stir the ingredients in the spicy oil. In the meantime, chop the chicken and add it to the pan. While the chicken is simmering away, grab a medium to large sized bowl and chop all veggies except the sprouts and spinach and add to the bowl. Pour a bit of oil on top of the veggies and stir it around. This is great time to check on the chicken. Grab a pair of tongs and flip the chicken over and let it cook for a few more minutes. While I wait, I usually do some dishes quickly to kill some time. Once the chicken has cooked enough (brown on the outside) add the veggies to the pan. Then add spinach and sprouts on top and let it sit for a minute or so. The pasta should be ready by this time. Drain it and add it to the stir fry. Stir all the ingredients around with the tongs. 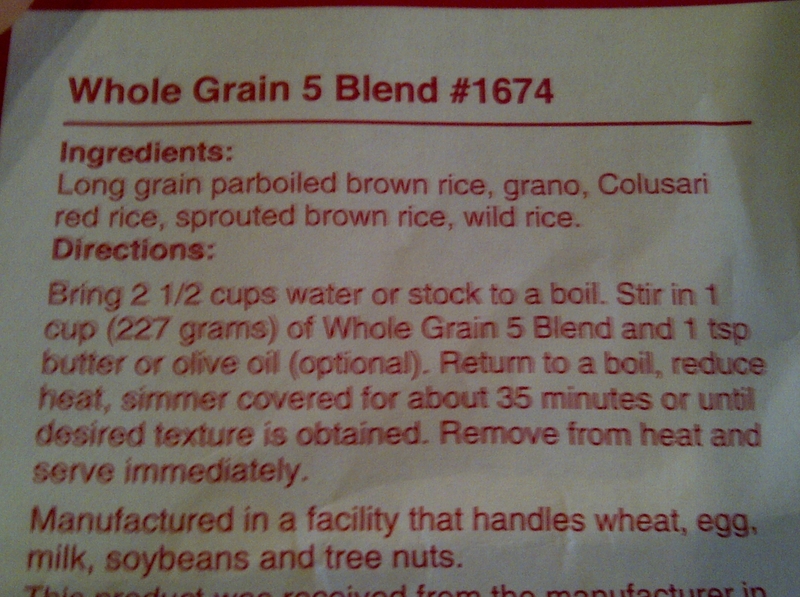 Let simmer and stir off and on for another 5 to 8 minutes. You’ll know it’s ready when the sprouts and spinach are limp. This should serve about 2 or 3 people OR enough for a second helping and lunch the next day. The entire process should take about 20 to 30 minutes. Detox: Always seems like a good idea at the time…. Well, I wish I had a good excuse for why I’ve been MIA the past couple of months, but I don’t. The holiday season was pretty crazy for me and my work load exploded. So between working lots and a full social calendar, I didn’t have much time to cook let alone blog. Then after Christmas, I had a few personal things to deal with and now, I’m back on track! Since my eating habits needed a lot of fine tuning after one too many pizza nights and pitchers of beer, I recruited a friend of mine to do a detox diet with me for the next few weeks. What that means is: no dairy, no wheat, no refined sugar, no caffeine, no booze, and no smoking – basically, no junk! It’s day 2 and I have to admit, it’s pretty tough so far. Temptations are everywhere! I was walking home from work tonight, starving, and I saw a massive poster for a large pizza for only $5. You have no idea how tempting that was. Or maybe you do. But I stayed focused and realized that quitting on day 2 is pretty lame, even for someone as inconsistent as me. The secret of doing these kinds of diets is to plan ahead and make sure that you have enough of the right food on hand so that you don’t blow your diet and order a pizza (like I almost did) because you’re way too starving to even open the fridge. I’ve been there – it’s riduculous. It’s amazing, too, how when you “deprive” yourself of certain things, it seems like that’s when you want it most. Today, for instance, was my first day back at work after four glorious days off and my eyes didn’t stop burning for one minute the entire day. Nope, not one single minute. All I wanted was a nice cup of chai tea or even a small cup of coffee to get the motor going but I’m not allowed. I ended up just sitting, staring blankly at my computer screen and imagining how delicious and satisfying a cup of coffee would be. Out of sheer will, I snapped out of it and got a cup of green tea and some water instead. It only took about 5 cups of green tea before I sort of felt like myself again and by then, it was 4:30pm; almost time to go home. I think tomorrow will be better. It`s got to be. I’ve done these detox diets before and I always find that the first days are the hardest (mostly mentally). For me, the hardest things to give up are drinking alcohol and dairy. To get through, I usually make a deal with myself that at the end of my detox, I’ll treat myself to a nice glass of red wine and some goat’s milk ice cream. Not both at the same time. Anyways, today was pretty easy – for breakfast I had 2 eggs and some soy milk blended with strawberries; for lunch I had a MASSIVE spinach salad and for dinner, I had a delicious stir fry. I sent pictures to my friends who’s doing the detox with me and he was pretty jealous so I promised him that I’d blog about it. You’re welcome! In a large frying pan or skillet, pour about 3 tablespoons of olive oil and let it heat up. Once it’s heated, add the spices and stir them around so that they mix in with the oil. 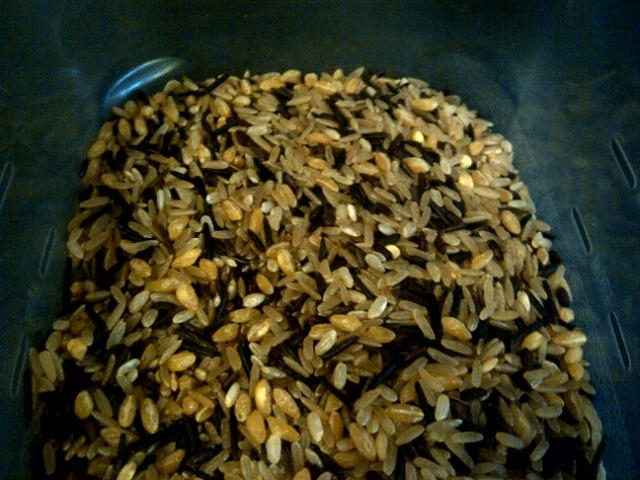 Boil the water and cook the rice pasta or rice as directed. Once the spices have heated up and are fragrant, add the diced onion. Stir it in the spiced oil and lit it simmer. Add the garlic and the diced tomato and stir. Let it cook for about 3 or 4 minutes, until the onions become translucent. Squeeze the juice from the lemon and the lime and pour it in the pan. Add the diced chicken and let it cook for about 5 minutes. 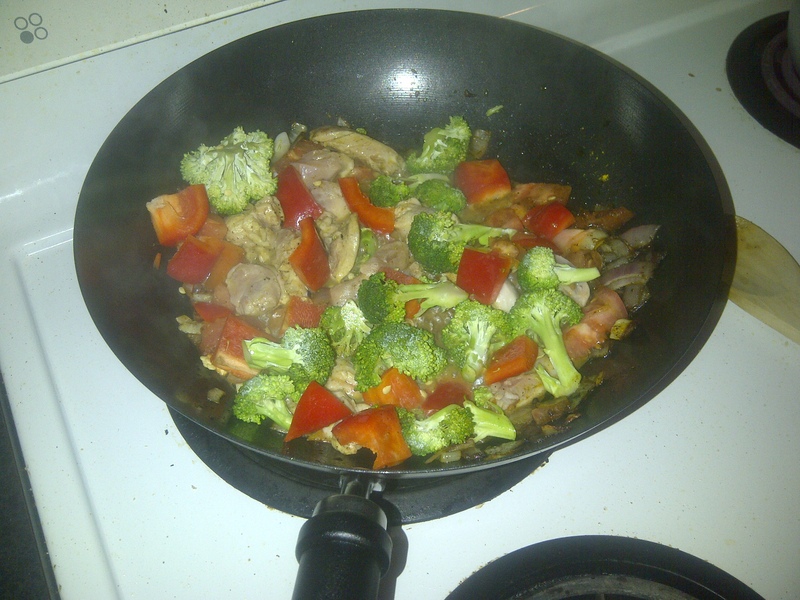 Add the broccoli and the red bell pepper. Stir all the ingredients together and make sure that the chicken pieces are cooked on both sides. When the chicken looks like it’s mostly cooked (should be brown and nearly crispy on the outside with no visible raw skin showing), add the sprouts and the spinach and stir, mixing all the ingredients. 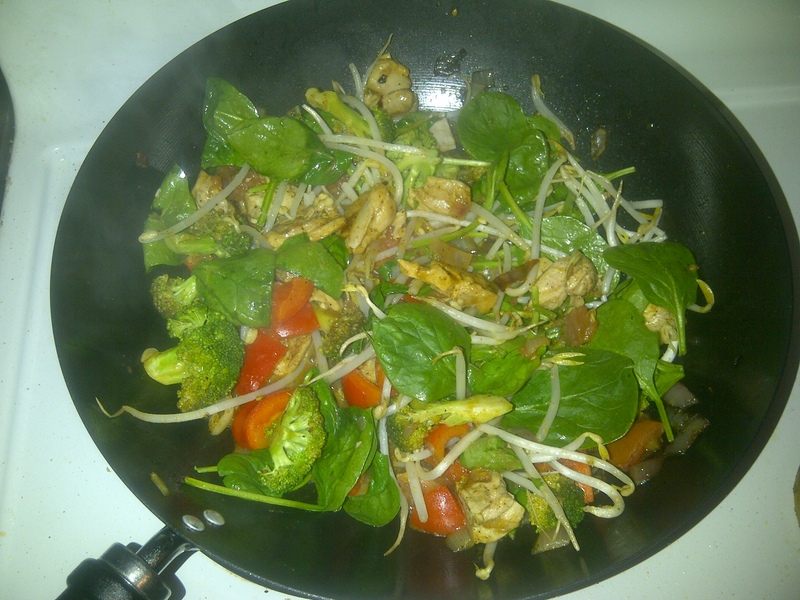 The stir fry is done when the spinach and sprouts are limp and have mixed in with the other ingredients. When the rice pasta or rice is finished cooking, add to the pan and stir. This should serve 2 but I like to put some aside for lunch the next day. Day two! 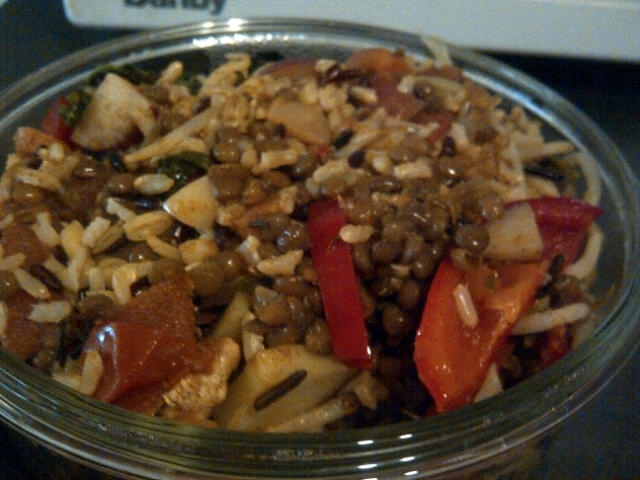 Seriously, there is nothing better than waking up and realizing that your lunch is already made. Actually, the next best thing is waking up and realizing that it’s Saturday. I was so tired this morning that it took me at least 3 minutes to figure out where I was and what day it was. That’s normal, right? But after a couple of cups of tea, I’m feeling more energetic and able to keep up a conversation without struggling, well..sort of. Is it lunch time, yet? Home time? It’s only Tuesday, right? Last night, I had a tonne of errands to run, since I was so lazy on Sunday and needed to make something quick. I realized that I had some salmon to clean up so I decided to make baked salmon in a bit of lemon juice with spices and then a veggie stir fry and all over some rice noodles. I was going to make some brown rice, but I dropped the ball and thought of it a bit too late – so noodles it was! Put the salmon fillet in a baking dish and pour the water and lemon juice in the base of the dish. Sprinkle the spices on top of the fish. Place in the oven and bake for about 20-25 minutes. The beauty of stir fries, is that you can seriously make them with any combination of your favourite veggies and spices. Be careful of sauces as they often contain extra sodium and sugar and preservatives which totally defeats the purpose of making a healthy stir fry in the first place! Prepare the rice or noodles as directed and steam the broccoli. While that is cooking, heat the oil in medium or large frying pan (whatever you prefer). Once the oil has heated, add the black pepper and parika. Stir the spices in with the oil until fragrant. Add the onions and stir until they are soft then add the garlic. After a few minutes, add the red peppers and stir, then add the carrots and the broccoli (after it has been steamed). Stir in the soy sauce or liquid aminos and let simmer. 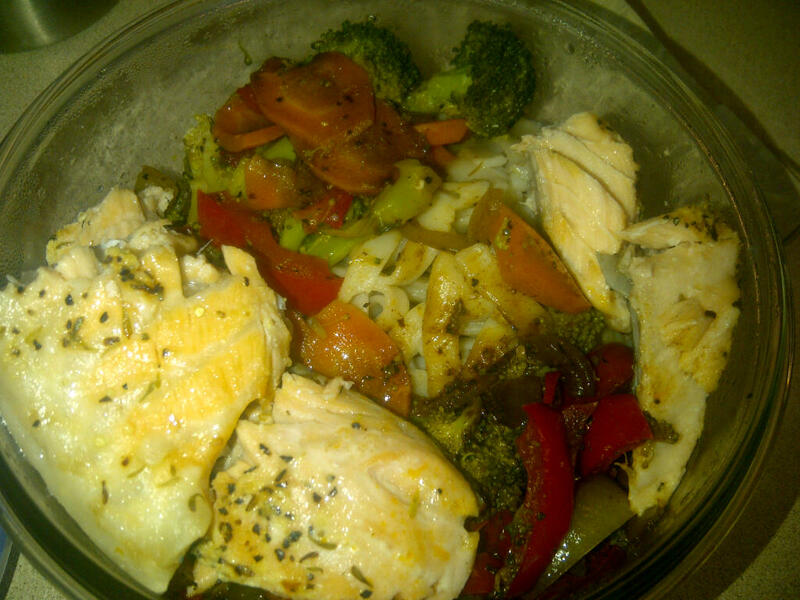 When everything is ready, cut up the salmon and place veggies over the rice and serve. Well, I have been slacking this week. There really isn’t any valid excuse that I can give other than I have been taking a lot more time for myself these days and honestly, I’m loving it! In January, I’ll be starting my courses at Humber to be a project manager and between that, work and my Toastmaster responsibilities, I’ll be busy. Better to enjoy some down time now! As today is Monday, I’d like to begin, or rather, re-begin (is that a word?) 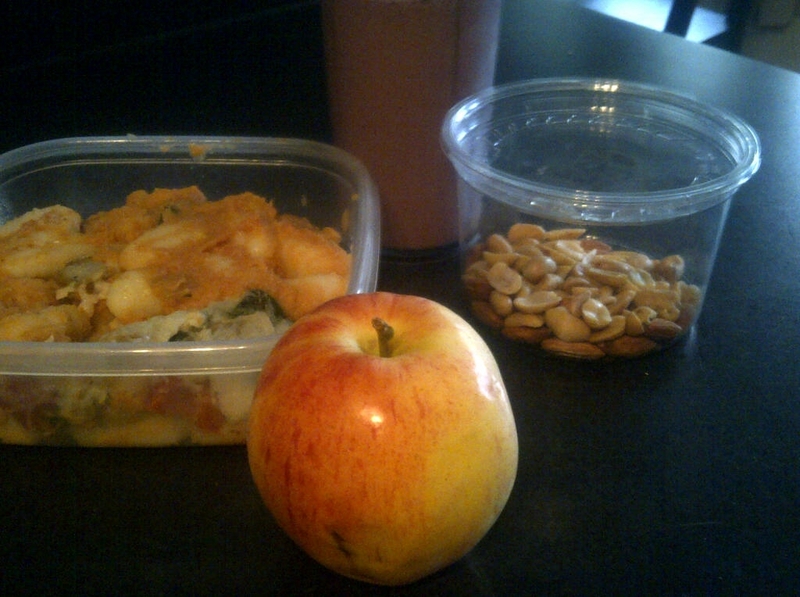 my “lunch a day” for a month challenge. 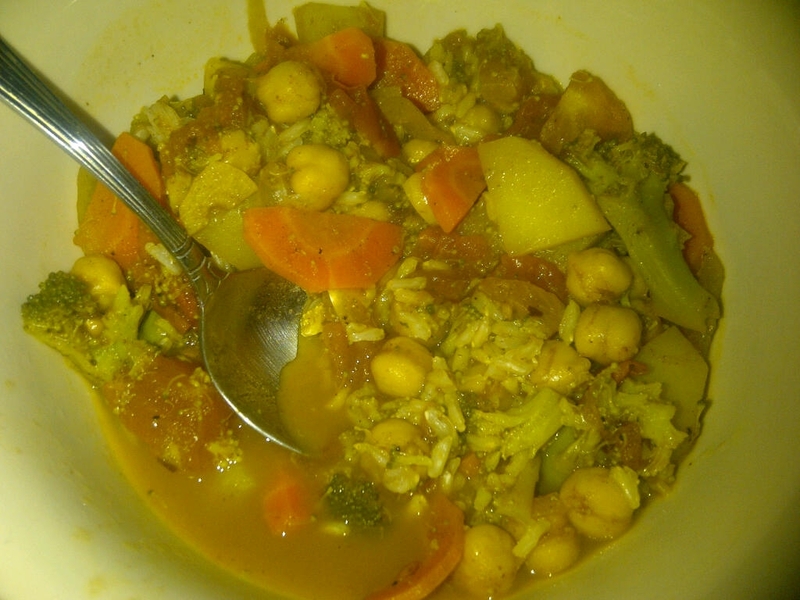 Today, my leftovers were chickpea coconut curry. YUM! It was Sunday evening, I had no desire or motivation to go the store so I scrounged up whatever I had in my cupboards and fridge and I came up with this little number. This looks like a lot of ingredients, but it was SO easy to make! In a large sauce pan, pour the oil in and let it heat up. Then, add the onions and cook until they are soft. Add the black pepper, chilli flakes, coriander and thyme. Cook for a couple of minutes (until fragrant). Add the garlic and stir. Once this has simmered, add the potatoes and ¼ of the can of coconut milk and stir until simmering. Then, add the curry powder, garam masala and turmeric and stir. Let it simmer and add the other ¼ of the can of coconut milk. Cover and let simmer for a few minutes. Add the chopped tomatoes, the chicpeas and the other ¼ can of coconut milk. Let simmer for about 10 minutes. Stir the pot and add the quinoa and the rest of the coconut milk. Stir again and let simmer for about 5 minutes. This may look kind of weird, but it was absolutely delicious and tastes even more amazing the next day. If I could, I would have added spinach to this, but I ran out so I had to do without. Shredded carrots would also be amazing in this too – or any other veggie that you love and cannot live without. I find that by layering the ingredients, you get a fuller flavour and a more cohesive sauce/curry. If you don’t have quinoa, you could always skip the step and serve over brown rice. Let me know what you think and share with me any variations that you may have tried. What’s so great about leftovers? Especially a mish-mash of veggies sitting in your fridge that don’t quite fit into any other recipe? They’re great for making soup! The other day, when I was looking through my fridge, I noticed that I had about a handful of spinach, half of a head of cauliflower and a half a bag of baby carrots that weren’t going to eat themselves and I couuldn’t think for the life of me what I could use these for. Then it hit me…I decided to get creative and make a soup out of them. Yes! Genius! I know it’s about 40c here, BUT I couldn’t let these go to waste and it’s SO easy to make soup. Plus, I’m feeling pretty confident these days about my mad cooking skillz so I decided to try out my very own original recipe (though I’m sure someone has made this at some point in time). Anyways, it was easy, and delicious! If you love creamy soups with a bit of kick, then this will totally be up your alley. 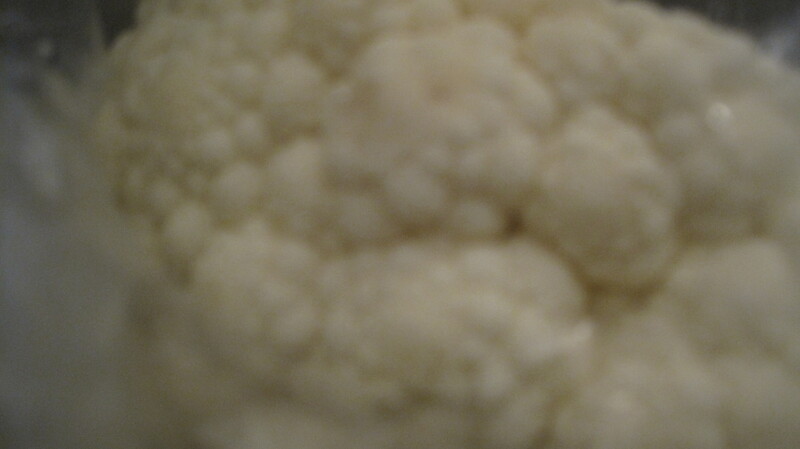 Steam the cauliflower, carrots, ginger and jalapeno pepper until soft. Test it by sticking a fork in the carrots and cauliflower. Add some of the steamed veggies, the spinach and spices to a blender. Slowly add the veggie broth to blend. Slowly add broth and veggies until all ingredients are mixed. This will be a hot soup, so make sure that your blender or food processor can handle the heat. Serve immediately and add that dollop of goat cheese and mix it in the soup. TIP: Freeze extra portions for later! Serving: Makes about 4-6 cups. Time: However long it takes to steam your veggies plus 10 minutes of blending.